Fast aperature, zoom range, and sharpness. I wish it were metal. Some complain of weight - I believe bigger is better. Fantastic lens. Sharp, I have had 3. The first was stolen with my Fuji S1. The second sits on my Canon 5d and the last on sits on my Nikon F5. This lens with its fast aperature and zoom range is a must for every photographer. When I shoot weddings - no one questions if I am using something they might have. have read others examples have had some softness. The only thing I have noticed is some slight chromatic abberation. This lens is sharp. Buy the cleanest one you can find! 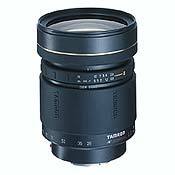 Tamron glass has always rivaled manufacturers lenses and this one is no exception. The lens is a fast and sharp lens. Does shoot very close for, say the ring shot at a wedding. Perfect focal length for a wedding or the like. I like the nice lens hood included. the lens is heavy, due to speed of the lens. Zooming is tight. Manual focus is smooth. I purchased this lens, needing a fast lens for film. So far, the images are very sharp and crystal clear. I am still shooting this lens and will have alot more information later. I have used this for weddings and other photos where low light is present and I may need a fast lens. I would recommend this lens to anyone who wants a fast lens for film or digital. I have not had a chance to use customer service. The lens keeps working. I have used other zooms of same focal lengths, but not speed. This lens, other than the weight and tighter zooming is a very nice lens for the low light shooter. The only weakness I found was the rather slow AF, especially in low light conditions. With the digital rebel in Full Auto mode,I pushed the shutter release and Nothing happened. I had to push it half-way down to allow it to focus before it would let me take the picture. I just purchased the Canon Digital Rebel D300. This was my first foray into digital photography and I love it. I found the lens to be a delite. Heavy enought to make you feel it made well, and with the range I feel will make it a stay on all the time lens. Interesting how far apart the opinions are for this lens. I'm wondering if Tamron improved it in recent years as recent reviews seem much more positive. I have had this lens for about a week and use it on a Canon 10. It is the only NON- CANON "L" lens that I own, so I am veery critical when it comes to performance. I conducted a series of tests at various focal lengths and apertures, comparing this to the Canon 28-70L (one of Canon's best) and felt the Tamron performance was outstanding in head to head results! I printed 8x10s on a Canon 9100 of enlarged sections of the images and could see no differences in the results. OK....its possible with optical testing equipment the Canon lens might test better: I'm not equipped with such equipment. But after 50 years of photographic experience, I am certainly capable of comparing prints for resolution and contrast and saturation, and thats what matters! This lens does not disappoint! But just to be sure, I showed the prints to my photo pro buddies who thought the Tamron results were equal to or better than the Canon. I think the construction is very solid and I like the "drag" adjustment feature on the zoom ring. I am diasappointed that there is no manual focus capability while in the auto focus mode. This is a heavy lens, but if you own any of the Canon "L" zooms, this should pose no problems. The filters are only a few more bucks than the 77mm required by several of my Canon lenses...not a big deal. I have not shot in direct sunlight, so I can't comment on flare characteristics, but I haven't shot with a lens YET that didn't have a problem in those conditions. Bottom line, I think this a great performer with a nice range for landscapes and portrait work with a fixed f/2.8 for low light shooting...recommended! One lens coverage. Sharp and contrasty at all F stops. Heavy. Would like to have macro capabilities. color sat, contrast, range, bright f2.8 max aperture, great image quality at f5.6- f11. I have shot with this lens for 3 yrs +. I get great results at f5.6 and up. F4 with good lighting can be ok, but i dont like it at f4, f2.8 is a disaster IMHO. 28mm has pronounced distortion at the horizon, ie yoiu see the curvature of the earth, but that doesnt bother me at all. Color saturation and contrast is better than any of my nikkor AIS primes, that is a fact. Image quality is not as good as nikkor primes, but at f5.6- f11, it is very close. contrast and saturation definatley is better than nikkor AIS primes. I use the lens at 105mm all the time with good results, and i like image quality at 28-70 best. It is a very very usefull focal range at constant 2.8 brightness for viewing, the best lower priced zoom for the money for events and weddings. I have not needed any in the 3 yrs i have owned this lens. everything under the sun by nikon, tokina. Flare is evident when the sun is inside the frame or just outside it (yes, I constantly use the lens hood). However, it is not that bad. If you are less picky than me, it might not bother you. AF is on the slow side. Filters are expensive. This is nit-picking but nevertheless I don't like it: Length changes when you zoom. Lens hood does not lock and unlock with the assurance of the Canon lenses. Have it for more than a year and overall, I'm very pleased with it. It's permanently stays on my Canon 7e. Yes, it's big and heavy but OTOH, I'm not a smallest guy in the world myself. It gives very sharp pictures from f/4 onwards and wide open shots are also usable. Want to give an old lady a flattering portrait ? Use this lens wide open on the tele-end. She's going to love you. Just a thought, could it be a wedding photographer's dream lens ? I am going to sell this lens soon as I am moving to Canon's L (70-200/2.8 IS) and primes (35/2 and 24/2.8). F/4 is just too slow and has too wide DoF for me. If it wasn't for this, I would not part from it. Canon 28-105/3.5-4.5 USM. It has USM, lighter and smaller. However, it only gets sharp from f/8 onwards. As I like shallow DoF, wide (and sharp) aperture is important for me. For this reason the Canon mostly stays at home. I like this lens for the price, features, size. Also, it is extremely flexible consumer lens with minimal drawbacks from wide range nature 28mm to portraits 85mm. A great starter lens and probably the best lens to have if you can have only one with quality, especially for trip photo hunting. Generally, it is more worth than NIKON MF35 - 105mm F/3.4 - 4.5 with better quailty & price. Don't trust only in the Brand Name of Manufacturer, there are exisiting of many OEM products with low rank quality. Actually, if you only use for Portraits from 85mm - 105mm, this lens is not a good choice for you in F/2.8. Imagine will become only get better after F/4 with iso100 in normal situation. Finally, I can say something you expected that you can get it from this lens. Filters are expensive, due to size but that is to be expected with a 2.8 lense of this range. I have used this lense for about 3 years, on a Minolta 500si body. Mostly Weddings, Family Gatherings, Births, and Vacation shots. Extremely well made lense. Durable and Dependable. One must use common sense when handling lense, due to it's size and weight but with proper handling, I have never had any issues with this lense. Sharp, detailed Pictures even under extreme low light conditions, when mounted on a tripod. (I highly recommend using a remote shutter realise) My first Tamron product and I am impressed. Never had to use, which speaks to the quality of the lense itself. Sharp, fast aperature, fast focusing, comfortable handling. Purchased this lens in spite of some poor reviews on this site. Mainly since many professionals have listed as equipment on their spec sheets in mags and such. I have been nothing but PLEASED with my results. Shot a wedding with it last month and all details were there. It is also fast focusing. Its macro capabilities also are very pleasing. I would highly recommend this lens.